Nothing will Jazz Up your look like a Fedora. 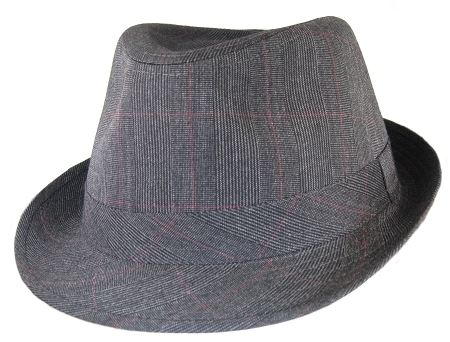 This 4XL Black Plaid Fedora is made up of black, gray and a tiny bit of red. This hat fits a little more snug than the straw hat, but it's still great. I'm so use to not having hats that fit.... That these are wonderful. Just what I was looking for. Comfortable. Light weight. Crushable. And BIG for my big (female) head. Wear it every day. Excellent hat. It's nice to finally have a hat that fits my head! And it's such a nicely made, sharp looking hat too! This hat is stylish and fits big heads. It's about time that big heads get stylish headwear. Recommend going up to 5x in the fedoras! I received this Fedora and it fits. It does run big as stated, 8 1/2 to 9 seems right. I have a 26 inch diameter head and this hat fits. It may be slightly big if your head is a little smaller, but it is no problem to my 26 inch head. Hat is comfortable, light weight and nice. Recommended!